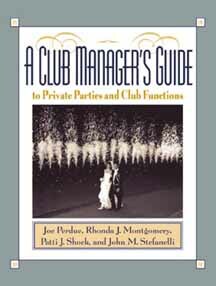 Written by club management professionals, this guide "speaks the language" of club managers everywhere. Focusing exclusively on the practices, terminology, and business demands unique to club catering, it covers all crucial management aspects of private parties and other club functions. It provides clear, step-by-step guidelines, helpful hints, and rules of thumb on subjects ranging from room selection and setup, meals, and beverages to staffing, member relations, and financial reportseverything the busy professional needs to keep things running smoothly. Special Events in Private Clubs: Types of Catering or Special Events Within Private Clubs. Club Catering Department Functions. Club Catering/Special Events Department Objectives. Club Catering Department Organization. Staff. Club Catering Department Policies. Major Challenges. Identifying and Reaching Your Markets: The Business Market. Special Events Market. Developing a Marketing Plan. Marketing Brochures. Member/Host Relations: Function Negotiations. Communications with the Host. Problem Resolution. Protocols. Working With Other Club Departments and Outside Agencies: Other Club Departments. Outside Agencies. Meal Functions: Purpose of the Meal Function. Factors That Affect Menu Planning. Truth-in-Menu Guidelines. Menu Pricing. Menu Design. Types of Meal Functions. Beverage Functions: Purpose of the Beverage Function. Beverage Menu Planning. Beverage Menu Pricing. Types of Beverage Functions. Liquor Laws. Third-Party Liability. Function Room Selection and Setup: Appearance. Location. Utilities. Space Requirements. Planning the Function Room Setup. Employee Uniforms. Cleaning and Maintaining the Function Room. Communication in the Function Room Areas. Equipment Inventory. Production and Service Planning: Production Planning. Service Planning. Catering Safety and Sanitation. Other Member/Guest Services: Providing Other Guest Services. Audiovisual Services. Entertainment. Lighting. Other Services. Intermediaries. Staffing: Employee Recruitment. Orientation. Training. Compensation. Financial Controls and Reports: Banquet Event Order. Prefunction Sheet. Change Order. Catering Agreement. Credit Management. Food and Beverage Cost Control. Payroll Cost Control. Computerized Control Procedures.